I’m definitely a fair weather person (meaning, I hate cold weather!). Those are the two most important things to know about me. My father was in the U.S. Air Force for the first 18 years of my life and I was fortunate to live in other countries, such as Spain and Bolivia. At the age of 13, I fell in love with a television cowboy in a black hat. He would change my life forever. I have been involved in animal protection for roughly 50 years. I’ve worked as an undercover anti-cruelty investigator for state humane societies, and as an editor and designer of numerous animal defense newsletters and magazines, most notably the award-winning, international animal protection publication, The Animals Voice Magazine (which I founded 30 years ago and still publish today). Over the years, I have been employed by the League of Humane Voters, The Fund for Animals, Farm Sanctuary, The Animals’ Agenda Magazine, In Defense of Animals, and Animal Guardians (to name just a few organizations), as well as The New Jersey Herald, the Chico Enterprise-Record, and the Chico News & Review. I am also the author of a novel inspired by Pete Duel’s effect on my life, called Fade to Black. I stay busy spreading the message of animal rights through print and web sites, writing fiction, and enjoying old movies. I’m the creator of The Pete Duel Memorial Site, a Starsky & Hutch fan site, a David Soul Fans site, and I design and maintain David Soul’s official web site with him. My story wouldn’t be complete without mentioning that I was the person chosen by a horse on his way to slaughter to be an ambassador on behalf of equines worldwide. 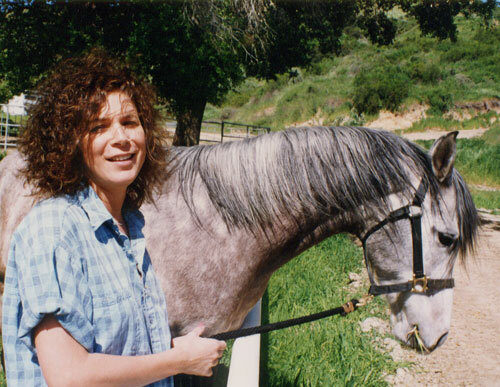 I called him ‘Shilo’ after the Neil Diamond song by the same name, and I operated a small horse rescue sanctuary for ten years in Shilo’s name. Shilo passed away in 2011 at the age of 28. He was in my life for 22 years. When it comes to horses: I am an Advisory Board member of Return to Freedom Wild Horse Sanctuary (RTF), and was co-director of the National Wild Horse Rescue & Sanctuary, which oversaw the rescue capture of 236 wild horses from the Hart Mountain National Antelope Refuge in southeastern Oregon — alongside a real life cowboy: my dear friend, lover, and husband of 30 years, Jim Clapp. To learn more about me click here.